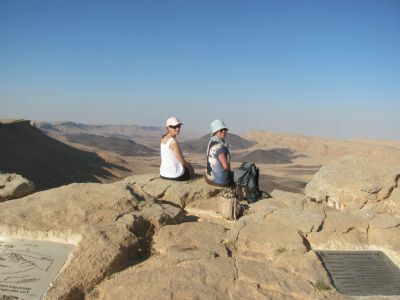 Perched on the edge of the Ramon Machtesh at it's western tip is Israel's third highest mountain, Mt. Ramon 1037 meters above sea level. Close to the peak and right on the lip of the Machtesh is a memorial for the crew of NASA space shuttle Columbia. Among the crew on Coumbia's last and fateful mission was the Israeli astronaut Ilan Ramon. Mactesh Ramon is not named in his memory but in fact Ilan Ramon changed his name (as many IAF airmen did and still do) to a more local sounding name - from Wolferman to Ramon and the name he chose was because of his awe for this amazing geological wonder in the Negev. After Columbia's crash it was only natural that the Isaeli memorial for the crew be here on the edge of the Machtesh and close to Israel's third highest peak. The memorial commands a stunning view of the Machtesh and is well worth a visit. Near the memorial one can find numerous archaeological sites most of which date back some 4000 years. 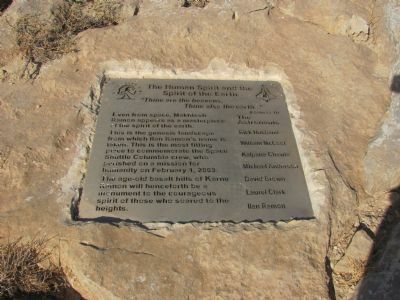 There are Tumuli - ancient burial sites , a mysterious 'K' line - a much discussed and apparently cult related structure, and the remains of old dwellings. Last week we visited this site with Pomegranate Travel's CEO Hannah Blustin and their guest and prominent journalist Teresa Levonian Cole both seen here sitting on the edge of the Machtesh close to the Columbia memorial. In the summer months especially the site is best visited in the late afternoon as the sun begins it's decent to the west and bathes the Machtesh in softer light that makes it even more beautiful. The high altitude means that the temperatures are relatively cool and the 4-5 km (2-3 mile) hike to the memorial is easily managed and well worth while.